Downtown Santa Barbara’s most popular and trendy sushi spot is also one of its best. 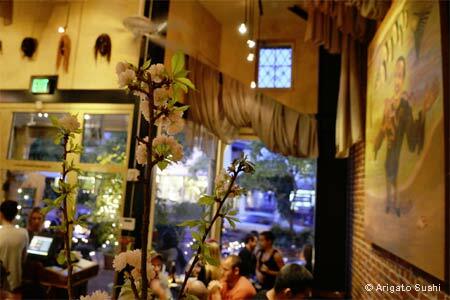 : This trendy sushi restaurant is one of the best in town, so it’s always crowded, yet reservations are not accepted. The voluminous interior of warm exposed-brick walls and an open kitchen makes the din noticeable, while the outside patio is ideal for summer nights --- both spots pulsate with energy. Arigato is all about fresh fish and seafood, prepared and presented with artful flair. Fusion is the name of the game here, and you’ll find bluefin belly sashimi treated with a truffle soy oil marinade; a starter of ahi carpaccio --- thin slices of translucent tuna dressed with minced scallions, red onions, smelt roe and Japanese vinaigrette; and sautéed edamame with spicy garlic sauce. The long list of appetizers, including sushi pizza, homemade gyoza and miso-glazed cod, are tried-and-true selections. Don’t miss specials board items like monkfish liver wrapped in a seaweed cone. We also recommend the spicy jalapeño yellowtail and the lush Gorgonzola salmon. Twenty sakés, a host of beers and local wines comprise the drinks menu. Desserts include ginger ice cream or plum wine sherbet.